Why would I need self storage in Brockton, MA? There are a variety of reasons why you might need self-storage in Brockton, MA. How much is a storage unit in Brockton, MA? The cheapest storage unit in Brockton, MA is $56.00 per month. What size storage units do you have available in Brockton, MA? In Brockton, MA we have sizes that range from 5'x5' to 10'x20' to suit your storage needs. How much is it for a 5'x5' storage unit in Brockton, MA? The cheapest 5'x5' storage unit in Brockton, MA is $56.00 per month. Brockton is a large, thriving city located about 25 miles south of Boston. It's often called the "City of Champions," thanks to famous natives Rocky Marciano and Marvin Hagler, both successful boxers. Brockton is also the holder of an interesting historic record, as the site of the first department store Santa Claus, pioneered by James Edgar in 1890. The land where Brockton is now established was originally home to the Wampanoag tribe. Ousamequin, a tribal leader, sold the area to Myles Standish as part of Duxbury. The English named the area Bridgewater, eventually renaming it North Bridgewater in 1821. Another name change came in 1874, with the name Brockton emerging in honor of British general Isaac Brock. The city of Brockton was officially incorporated in 1881. During the Civil War, Brockton emerged as a major manufacturing hub. It served as the country's largest producer of shoes, and the city's booming shoe and leather products industry flourished until the latter half of the 20th century. Since then, the economy has become far more service-oriented. Brockton is considered one of Massachusetts' intellectual cities, with Harvard in nearby Cambridge and the neighboring city of Boston featuring a rich culture and vibrant arts scene. This vibe is supported by a number of galleries, museums and cultural institutions throughout the area. In the greater Boston area, you can also visit historic sites that date back to the Revolutionary War or earlier. The Boston waterfront is another popular place to spend an afternoon. Within Brockton itself, you can learn about the city's past at the Brockton Historical Society. The museum features a tribute to the famous boxer Rocky Marciano, a Brockton native. The Fuller Craft Museum houses amazing kinetic sculptures, while the Brockton Country Club is a great place to enjoy a round of golf. Brockton Public Schools manages the public schools of the city. Campuses include an early education center and several alternative schools in addition to the traditional elementary, middle and high schools. There are also a few private and parochial campuses in Brockton as well as the nearby, tuition-free Southeastern Regional Vocational Technical High School. If you're considering pursuing a degree, you can attend classes at Massasoit Community College. Utilities: Brockton receives its electricity from National Grid and water services from the city utilities department. Garbage and Recycling: Trash and recyclables are picked up on a regular schedule, with pick-up days assigned according to your home's location. 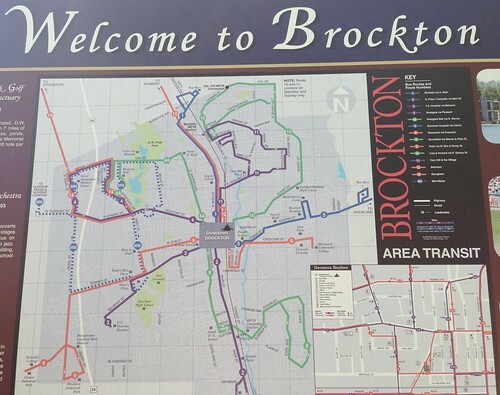 Transportation: The Brockton Area Transit Authority manages a network of bus routes throughout the city. The MBTA commuter line also passes through Brockton, which provides easy access to nearby Boston. Although Brockton is just half an hour from Boston, it's home to a far more affordable housing market. It's not uncommon for people to choose to live in Brockton for its less expensive cost of living and to simply commute into Boston for work and play. Even though it's fairly budget-friendly compared to Boston, Brockton is still more expensive than the national average. Our lowest priced units in Brockton, MA average $56.00 per month. 41 people have reserved units in Brockton, MA in the past 30 days. There is 1 location within Brockton, MA's city limits.